UPDATE: Due to snow and inclement weather, our showing of this event has been moved to Tuesday, February 25, 2014 at 6:30PM. Is creation a viable model of origins in today’s modern, scientific era? 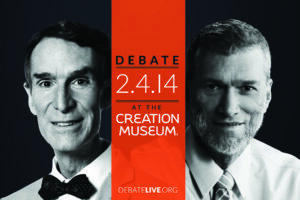 Leading creation apologist and bestselling Christian author Ken Ham is joined at the Creation Museum by popular TV personality and evolution apologist Bill Nye. Don’t miss this “debate of the decade”! We’ll be hosting a live stream of the event on February 4, 2014 at 7PM in the Fellowship Hall of Calvary Heights Baptist Church. Afterward, we’ll be have a discussion regarding the salient points of the debate. Come and join us at no cost!